At this year's Frankfurt Musikmesse we introduced a new guitar series: The Edition Series. It embodies 8 very different guitar models, ultimately an excerpt from the Lakewood Customshop. These guitars are there to inspire and to show ideas and options that are sometimes not so visible in public perception, because they find their new homes in somebody's living room right after they have been built. At the same time the Edition Series is a welcome playground for trying new things and to see how people react to new ideas and how they are being taken on by guitar players. The guitar models of this series follow conceptional considerations and embrace something very individual about their character. We show options that in the past might have been secretly hidden, like i.e. color finishes, short scale, 12 or 13 fret neck joints, or things like a 45mm nut width. We are going to release new models in this series every year - this will be the yearly edition. Those guitars will thus not be limited in numbers, but only time-limited. 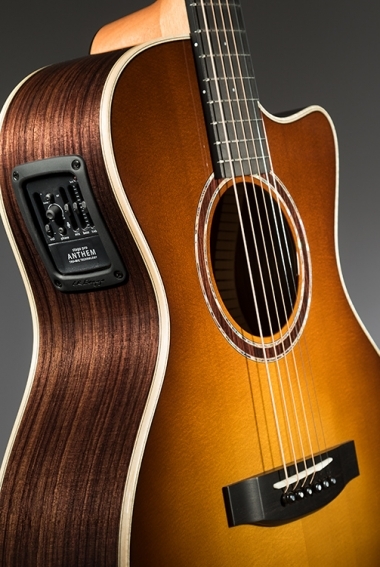 The A-20 Edition 2018 is a "classic mediator", a connection of the worlds of steel string and classic guitar. This instrument meets the passion of those who have lost their hearts in Jazz, Classic or Latin music styles. The A-32 Edition 2018 is simply a really cool guitar! Small, handy and totally beautiful with her combination of rosewood back and sides with a tobacco burst finished European spruce top. Perfect stage guitar, also equipped with the L.R. Baggs Anthem StagePro system. The A-35 Edition 2018 is another classic mediator and a little softer designed in comparison to her A-20 Edition sister. The body-neck-joint is classic-like on the 12th fret position, which gives her an extra quick response. The sensational oak additionally gives her extra elegance and an expressionistic tone. The D-14 Edition 2018 is our interpretation of the typical American Vintage round shoulder dreadnoughts with a 12th fret neck and a wider neck with slotted peghead. Check it out. This guitar is the compact version of our M-14 Grand Concert guitar. It's got a shorter 630mm scale with the body-neck-joint at the 13th fret. Wow. Also the neck width is somewhat smaller, 44mm. Good for people with small hands or small height. The M-24 Edition 2018 shows a little of our beautiful Claro walnut in combination with a bear claw spruce top (European). It's also got the Curve sound hole inlay and some other tasteful details to it. Sound-wise it convinces by tonal substance and rich mids. Spot on! The M-31 Baritone Edition 2018 proves that you don't necessarily have to use a huge guitar body in order to create a big sound! The rather compact Grand Concert shape serves the job well as it is adapted constructionally in the right spots. The instrument is an ergonomic blessing and closes the gap between guitar and bass (yes, there is one...). The guitar is equipped with the L.R. Baggs Anthem pickup system. The M-32 Edition 2018 is the short scale sister of the well-known M-32 CP, but with a cedar top. It is sound-intense and uses the properties of cedar in combination with the rosewood back and sides. It's got a 13th fret neck joint with a 630mm short scale, which allows stress-free playing through days and days and days and days. Please ask your wife to bring you drinks and food from time to time.